What could be more exciting than learning about carpet specifications? Okay, fair enough. But stick with me. If you plan on buying carpet, this is important. And don’t worry, I’m not going to educate you on how carpet is threaded into the backing. You can find that on another website. No useless details here. This is only the information that impacts how long your carpet will last. In other words, this report only covers what matter to you as a carpet shopper. This article is about the specifications that impact your carpet durability. There are important parts of the durability puzzle that are not specifications. Those can be found on other Carpet Captain pages like this one comparing carpet fiber types and this one on padding. Captain navigation warning! If you’re buying carpet and want to know everything that will determine how long it lasts, you need to start with the Captain’s Carpet Buying Guide. It’s a complete resource on buying carpet from planning to installation day. I’ll cover the pros and cons of each specification. You’ll learn how certain specs can be used against you. And I’ll give you ranges that indicate poor, acceptable, and best durability. Let’s start with the most common carpet specification. Face weight is the most common specification you’ll find to determine a carpet’s durability. Face weight is the weight (in ounces) per square yard of carpet. This is a good but not perfect measure of “how much” carpet you have. What do I mean by “how much” carpet you have? Face weight measures how much the fiber/yarn of the carpet weighs. Think of it like weighing t-shirts that are all the same size. The more they weight, the thicker and more durable the t-shirt is going to be. The only difference being durability matters much more in carpet. People aren’t walking on your t-shirts all day. Earlier I said face weight is a good but not perfect measurement. That’s because it can be misleading. It doesn’t take into account how “tall” the carpet is. The height of the carpet fibers will increase the face weight, but it doesn’t improve the durability (if anything, it leads to carpet breaking down sooner). Let’s say you’re looking at two carpets. One is named ‘The Durable Carpet’ and one is called ‘The Misleading Carpet.’ You look at the face weight of each. ‘The Misleading Carpet’ has a 40 oz face weight, and ‘The Durable Carpet’ has a 35oz face weight. ‘The Misleading Carpet’ is the more durable carpet right? And I think you can see where I’m going with this. You look into it more and ‘The Misleading Carpet’ fibers are twice as tall as ‘The Durable Carpet.’ That artificially inflated the face weight of ‘The Misleading Carpet.’ It turns out, ‘The Durable Carpet’ is the denser, more durable carpet. It just had a lower face weight because its strands are shorter. What face weight carpet should I buy? You want at least a 35 ounce face weight carpet for maximum durability. Depending on other features of your carpet, a lower or higher face weight may be required. Factors that may affect the minimum face weight needed are how often the room is used, the carpet’s twist level, and the carpet’s density. A carpet’s total weight is the face weight + weight of the backing. Backing is heavy compared to the carpet fiber, so total weights are much higher than face weights. The weight of the back also doesn’t mean much as far as durability. Yes, a heavier backing may be better made, but it’s not accurate enough to judge a carpet. What total weight carpet should I buy? Trick question. Total weight is too misleading to give you recommended values. Captain’s warning! Don’t get scammed by a money-hungry salesman. A salesman may tell you the “weight” of the carpet but use the total weight instead of face weight. Why? Because it can make a poorly made carpet sound good. Watch out for a pitch like this: “This is a great 80 oz carpet.” Anytime the salesman doesn’t specifically say “face weight,” ask him to clarify. Don’t worry, there won’t be a quiz. The equation isn’t important, but breaking it down reveals a couple important takeaways about density rating. The most important takeaway is density rating eliminates the flaw of face weight: the longer/higher pile the carpet, the lower the density rating. The second takeaway is density rating is a much higher number than face weight, so face weight and density rating can’t be compared directly. If you want to go through the work, you can convert face weight to density by multiplying the face weight by 36 and then dividing by the pile height. You should be able to find the pile height in the carpet information. If you can’t find it, you can measure it yourself (base of the carpet to the top of the carpet fiber). What density carpet do I need? You want a carpet density with a density of 2,900+ for good durability, and I’d be cautious with anything less than 2,500 in moderate traffic rooms. Density is the best specification to determine durability. But remember that there are other factors that impact durability. Depending on these other factors and how much traffic your carpet will get, the density rating you need can vary. Wear rating is a subjective measure of how long the carpet will last. It’s determined by the carpet manufacturer, and it’s usually a 1-5 rating system. Since the rating is created by the same company selling the carpet, it’s in your best interest to not put too much stock in it. The problem with the rating is the manufacturer can give a bias toward anything they want to sell. If they have a “new and improved” stain protection that gives them added profits, they’ll likely give carpets with the new stain protection the best grade whether it works well or not. The most important reason to throw this rating out the window is you can make a better “wear rating” of your own. Your knowledge from this page and our carpet buying guide gives you the best picture of how well a carpet will hold up. PAR rating is somewhat of a mystery, but I included here because I get questions on it. Most internet sources say it is a rating created by the carpet manufacturer Shaw. I reached out to Shaw, and they stated PAR is not a rating they use. I contacted Mohawk (the only carpets I have seen use a PAR rating), and they were able to give me an explanation. They didn’t go into specifics but said it based on an industry standard test using a mechanical drum (basically beating the carpet with a machine to see how much it wears). I put this is the same category as “density rating” (see above). It gives you some useful information, but there are better ways to determine how durable your carpet is. Twist level is the number of twists in one-inch strand of carpet. Higher twists result in a more durable carpet. Lower twists can lead to the carpet unraveling. This can make a carpet look old fast. As an analogy, think of braided hair. Twist the braid once or twice, and it’s going to be loose and fall apart. If it’s tightly twisted, it will hold together throughout the day (I have a feeling I somehow blew my cover that I don’t know much about braiding hair in this last paragraph, but hopefully the analogy still made sense). Many shoppers overlook twist level. It may not be as important as the density rating, but it still can have a major impact on how long your carpet lasts. No matter how high a carpet’s face weight, it will look terrible in a few years if it has a poor twist level. Here’s how to use this equation… Start by counting the number of twists in a strand of the carpet. Let’s say you count 3 twists. Next, measure the height of the strand of carpet. Let’s say it measures to be half an inch. Your equation is 3 divided by 0.5, which equals a twist level of 6. Captain’s warning! Twist level is not necessarily the number of twists in a carpet. In example, if a salesman shows you a carpet with 2” strands and tells you it has 8 twists, this may sound excellent at first, but then you realize the twist level would be 4 (there are 4 twists per inch). How many twists do I need in my carpet? Look for carpet with a twist level of 5 or more. The higher the twist level, the better. Four or fewer twists can lead to poor performance. Sometimes the twist level won’t be listed. If it’s a frieze carpet, you can assume it has a high twist level. If it’s not frieze, you can try to calculate the twist level (see the equation above). That covers the important specifications for carpet durability. If I had to pick only two of these to go by, I’d choose the density rating and twist level. If you can’t find or calculate the density rating, face weight is a good alternative. Wear ratings/durability ratings are too biased to use in your final decisions. Their only value is helping with what carpets are not durable. This won’t help you decide what carpet to buy, but it can help you quickly eliminate less durable carpets. In an example for high-traffic rooms, you could decide you won’t consider carpets with a wear rating of 3 or less. As for total weight, ignore it. It’s a misleading measurement. So where do you find these specifications? Any important specification should be easily available in the in-store carpet materials. The keyword is should. Some carpet shoppers tell me the store information wasn’t helpful. If they don’t want to give it to you, you can calculate some of the measurements yourself or consider a different store. You have a right to know how well made your multi-thousand dollar flooring investment is. You’re on the right path. Make sure to you cover the rest of the important details in our complete guide on how to buy carpet. 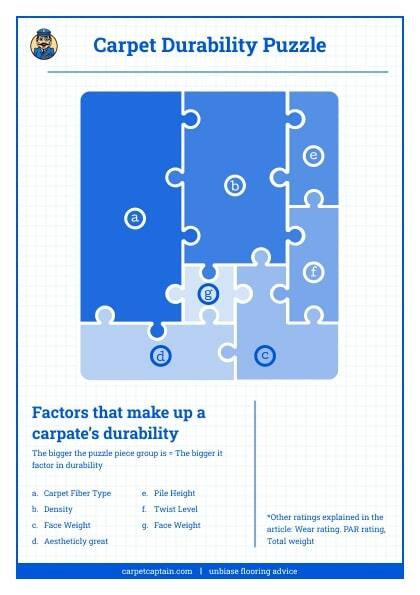 The most durable carpet in the world page might give you a more “exact” recommendation. But if you want to get an idea for yourself, maybe look at the image at the top of this page. It will give you how important different factors are. Then, you can see what range you should look for in durability in those areas lower in the page (I specifically list categories like bad, good, better). Also, make sure to check out the padding page and the carpet material page. These will have big impact on durability. I think Lifeproof makes quality nylon, but I also agree that the warranty doesn’t mean much: manufacturers know people don’t claim them, and even if they do, there are usually plenty of loopholes out of it. That said, looks like it’d be a pretty durable carpet. I didn’t look in detail but noticed the face weight was a little lower but is compensated by a short pile height (so it ends up being a good density). You’re right. Since they’re the same fiber, I’d go with the one that has the highest face weight and density. Thank you! I went to the store to see about getting area measured and price everything and as he was totaling he said “oh can’t forget the freight charge, that’s $100”. I’ve never paid freight on a carpet order before and am not now. Is that a new thing or just his thing? Don’t think that’s common unless it’s an unusual circumstance, or say, you were buying carpet online and it was shipping directly to your home. I’m sure it’s a cost for the store, but in the end, it’s a similar situation to when I a store has “free” installation: really all that matters is the total final price. Which Dean Weaver are you looking at? I’m also looking at them. East Hampton or Jackson Hole 2. I have high traffic area coming in from garage and front room. This is tough decision. I am looking at Fabrica “nibbaba anew” it is a 100% stainmaster nylon luxuerll 6.6 . It is 51 oz. face weight, density is 3672 and twist is 4.5. Do you think this will wear well on stairs (very heavy traffic) and a family room? Remember to match it with good padding, but looks like you picked a very durable carpet. And you’re right, stairs are brutal for carpets. If you wanted to be really picky, you could look for a higher twist level but really that should be a very good carpet. What weight padding do you suggest? 7 or 8 ? Higher’s better. I’d go with 8 all else equal. I went back to the carpet store and turns out the stairs are not covered for matting or crushing. It is covered for stains/soil…etc under the stainmaster warranty. I was told no carpet manufacturer covers stairs for matting or crushing. Is this true to your knowledge?? I haven’t heard that, but it also wouldn’t surprise me. Unfortunately, there’s almost always a loophole in warranties to get out of covering claims, so I more or less ignore warranties. Thanks for the education on carpeting. I know Polyester isn’t as durable but supposedly the Shaw Bellera poly is a new product that came out middle last year. Endurance fiber. It was step tested 20,000 times . Suppose to look the same as it did new after 5 yrs of wear . Thats why I asked for the comparison. Thanks again for all your helpful information. As you can see I did pay attention to face weight and twist.